This is the second positive article about Arab Americans in Orange County published in the Orange County Register in less than a week. 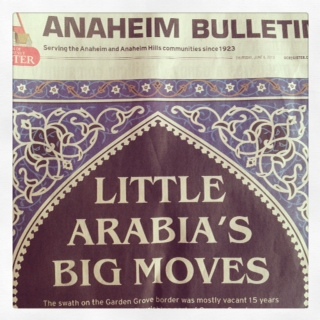 Today, the front page article of the Anaheim Bulletin was about the thriving businesses in Little Arabia. The swath on Anaheim’s border took root 20 years ago and is now a flourishing part of Orange County. Bold, curving letters emblazon the leather-bound books lining the long shelves at Jarir Bookstore in Little Arabia. The shop’s owner, Jarir Saadoun, greets customers looking for the latest Middle Eastern cookbook, historical texts, children’s tales, or novels by best-selling Algerian author Ahlam Mostaghami. Saadoun, an Orange County native whose father emigrated from Lebanon, said he opened the store a decade ago in hopes of preserving the Arabic language for families with deep roots in the Middle East. Saadoun’s attitude toward dual cultures is widely embraced by those living and working in the Little Arabia neighborhood straddling the Anaheim-Garden Grove border, concentrated along a 3-mile stretch of Brookhurst Street between La Palma and Katella avenues. Little Arabia has grown beyond the stereotype of simply having one of the region’s largest concentration of hookah lounges. The ethnic enclave is home to 25,000 people of Middle Eastern descent aspiring to preserve modest traditions while also thriving in Southern California. Grocery stores and meat markets sell halal products, the Islamic equivalent to Jewish kosher. Restaurants and bakeries serve traditional meals of hummus, baklava and shawarma. Bookstores sell books written in Arabic, while travel shops book trips to the Middle East. Muslim worshippers gather for services at the mosques that have sprung up in Anaheim and Garden Grove. Embroidered scarves and long dresses adorn the windows of clothing stores. Most importantly, the cultural hub serves as a network for Middle Eastern immigrants and refugees seeking support from people who speak their native language, said Yasmin Nouh, a spokeswoman for the Little Arabia-based chapter of the Council on American-Islamic Relations. About half of the storefronts lining Brookhurst were vacant 15 years ago, when Ahmad Alam started printing a map of the area he called Arab Town in his weekly publication, The Arab World Newspaper. Alam said he wanted to attract Arabic-speaking businesses and residents to the area so that his newspaper could be easily distributed within a concentrated neighborhood. Over time, Alam purchased wide swaths of Little Arabia and leased spaces to tenants hailing from throughout the Middle East, including his brother Mo Alam, who owns the Forn Al Hara restaurant and bakery. Among its most popular items, the affordable eatery serves up generous portions of spinach turnovers and flatbreads topped with cheese, chicken and oregano. “I like the fact that this area is becoming popular with people from outside the Arab community,” Mo Alam said as he slid a piping hot flatbread out of his oven. The Dalati family also has purchased large parcels of property in Little Arabia. The community has attempted to flex its political muscle through real estate agent Bill Dalati, who unsuccessfully ran for City Council; he recently served on a citizens panel that provided a series of recommendations for the future of Anaheim’s elections. Just across Brookhurst from a Dalati shopping center sits Al Anwar Islamic Fashion, where the windows display Muslim head scarves known as hijabs. Shelves are lined with long dresses and gifts imported from Jordan, United Arab Emirates and Kuwait. “These clothes aren’t available in Macy’s or other department stores,” said Ahmad Sarsak, who opened the shop 20 years ago, before the neighborhood was known as Little Arabia. A smattering of small grocery stores catering to the Arabic community have sprung up in the area over the years, and developer Mohammad Kaskas converted a shuttered hardware store into the Fresh Choice Marketplace in Garden Grove. The sprawling supermarket opened nine months ago, offering native Middle Eastern foods and a food court that serves up Arabic, Persian, Indian, Asian and Mexican food. Kaskas, a Palestinian who moved to the area from Jerusalem in 1985, said he also made sure the store is regularly equipped with halal and kosher foods. The ongoing conflict in Syria is felt as far as Orange County, where a festival aimed at promoting unity within the local Middle Eastern community might be canceled. The Arab American Day Festival – a local staple for nearly two decades – might not be held this year because of a perception that the event’s organizer supports Syrian President Bashar al-Assad’s regime. Local businessman Ahmad Alam launched the event in 1996 in the spirit of setting aside differences while also promoting the thriving business corridor known as Little Arabia, which straddles the Anaheim-Garden Grove border. The event’s program last year called for peace amid Syria’s civil war, sparked two years ago amid the wider Arab Spring that led to demonstrations and revolutions against oppressive governments in the Middle East. Protesters descended on the three-day festival in September at Garden Grove’s Village Green Park, claiming that Alam’s weekly publication, The Arab World Newspaper, supports al-Assad’s regime, which has been accused of being responsible for thousands of deaths.